From bouldering or on the mountain face: with the Togira T-Shirt Women, you will feel completely free to conquer your challenges. The T-shirt is made from a lightweight material that supports your movements and gives you the freedom you need in complicated maneuvers. 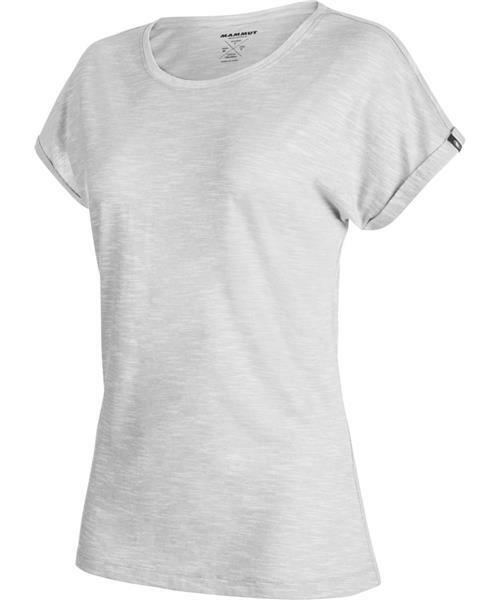 As well as feeling very pleasant on the skin, bioRe® Organic Cotton is also highly durable. The material can withstand even extreme situations. Making it perfect for climbing! Turned-over cuffs and the Mammut logo on the side, together with the tried-and-tested Regular Fit, make this T-shirt a must in the visual stakes too. A T-shirt that keeps its promises!